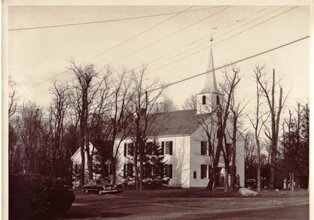 The early history of New Hempstead Presbyterian Church is the history of Rockland County itself. The first settlement in the territory that is now Rockland County was made at Haverstraw around 1681. The pioneer families who first lodged in this vast wilderness were Dutch– thoroughly Dutch–in their customs, language and religion. English speaking people came to this area from Hempstead, Long Island and settled near the crossroad that today we know as New Hempstead Road and Route 45. This place was important because the road north went to Kings Ferry, which crossed the Hudson and led to the New England states. Going west on New Hempstead Road to Suffern was also a well-traveled road to a southern route out of the county. The dictionary tells us that, in addition to an intersection, a crossroad is a point at which a vital decision must be made. During the past 281 years as a congregation, we have encountered many such crossroads. For example, in 1742, the congregation decided to leave the old log schoolhouse they used for worship, and build the first “English Meeting House,” just a few yards north of our present buildings. The Rev. John Lindsley was our first pastor. He received no monetary salary, but he was paid in produce. Old records show this produce included meat, flour, corn, Indian meal, oats, potatoes, clams, tea, and, of all things, rum! After an interesting saga of use and abuse during the Revolutionary War, the meeting house was in need of repairs. Old manuscripts tell us that a “subscription list” was circulated, money was raised, and by 1783 the repairs were made. As a young USA settled down to become a nation, a religious renewal swept the entire country. 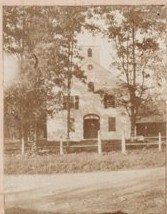 By the early 1800s the English Meeting House faced another “crossroad.” More space was needed. So, in 1827, the old church was dismantled and our present Sanctuary, the English Church, was built. Down through the ages this congregation has met challenges and needs head-on: when lightning hit the church in 1879; when the present Manse and barn were built in 1905; when the Colonial Room extension was added in 1932; when Murchison Hall was built in 1960; and when, in 1973, an electrical fire in the wall behind the pulpit almost caused the church to close down. The tradition of this church is to move forward, to Preserve our History so we can continue to serve each other, our community, the world and, most importantly, our Lord and Savior, Jesus Christ, in this place.